Let’s take a look at The Allman Brothers! The early lineup was Gregg and Duane Allman, Richard Betts (usually called Dickie or Dickey), Butch Trucks, Berry Oakley and Jai Johanny “Jaimoe” Johanson (Jaimoe). 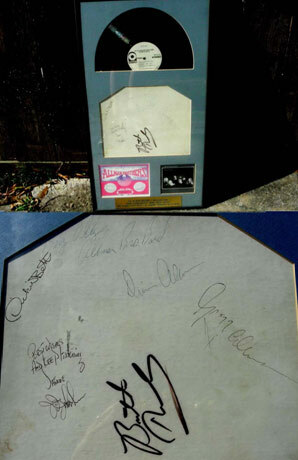 To the right is a very rare test pressing of their first Album signed by all 6 original members of the band. All but Butch Trucks signed “in the era” of the LP. This LP was mailed to Larry Lent in advance of them coming to Houston to play the Music Hall. 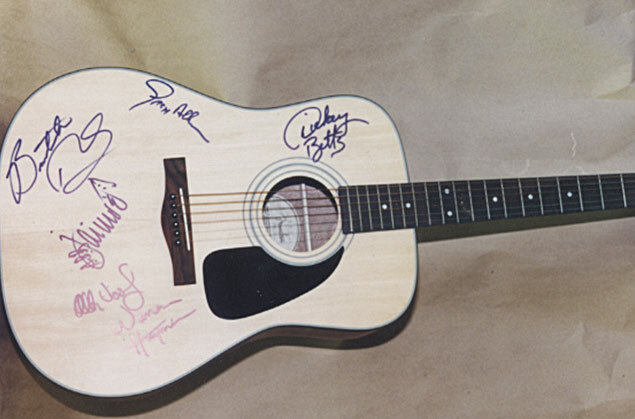 Note that in this early signed item Mr. Betts signed this as “Dickie” Betts. Also note the very rare version of Gregg signing his last name with a lower case “A” for Allman. I have only seen this done a few times ever. Also note the very cool and rare way “Jaimoe” signed his name; he signed Jaimoe then JJ Johanson, Berry also added “Allman Brothers Band” after his signature. On the interview tape you can hear Berry and Duane tripping out that Larry had this LP. Here is a rare signed check of Berry Oakley signed in 1970. Here is another from 1970 signed by Duane Allman. Above is an endorsed check from 1970 signed as Richard Betts. Notice the formation of the last name is exactly the same as him signing as Dickie. Here is a very unusual endorsed check from Feb 1970 with Jaimoe signing as Johnny Lee Johanson. 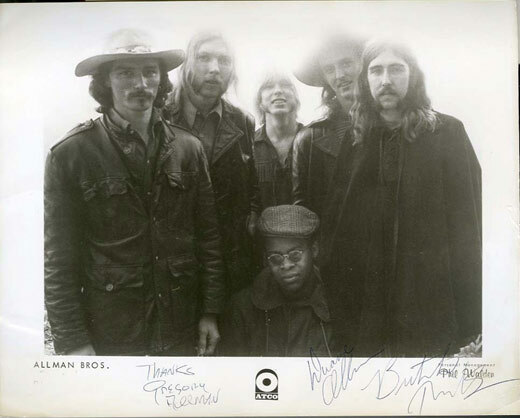 Here is an early promo photo signed by Gregg (as Gregory) and using an Upper case “A” in Allman, Duane and Butch Trucks. They were all still working on how they were going to sign their names in the early part of their career. Duane was the one that stayed the most consistent. Here is a signature from around 1995 and a signed photo from 1996 of Gregg. This style of signature stayed pretty much the same from the late 70’s throughout his career. Here is a guitar I got signed back in the late 90’s. Note Gregg still signing the same way and Dickey has now been signing as “Dickey” for some time. This guitar also has the late Allen Woody on it. I Hope the study helped clear up some of the myths and just plain ignorance of other so called web sites thinking they have a clue about music autographs. 20+ years of experience in music autographs says a lot and I always have the information to back up my statements.